Tagged under Age (Studio), Series. Knowing that her shy best friend Haruka Suzumiya has a crush on Takayuki Narumi, Mitsuki Hayase befriends the boy to facilitate her friend's love. As the three become friends, Haruka confesses her love to Takayuki, who accepts her feelings because he does not want to hurt her. But as Haruka and Takayuki become closer, Takayuki and Mitsuki realize their feelings for one another. Then tragedy strikes, and things are never again the same. What will happen because of the choices made in the wake of this tragedy? All in all, in its brief 13 episodes, the anime manages to present a realistic love story that is unlike any love story out there. For those looking for a love story that deviates from the usual giddy-type animes that make you feel good, this is the story for you. The TV series was too much of a trainwreck for me, it felt like much of the melodrama was forced and the story itself was like a badly written soap opera. I am not a fan of Mitsuki's route to be honest and she and Takayuki are a terrible couple, with all that happened I think it would've been better if they had gone their separate ways too. The friendship element is not strong in this series, which was another disappointing factor and it was taken for granted. The character designs by Yoko Kikuchi in the TV series was pretty and loved how Haruka and Akane looked, the two are my favorite characters of the series. I am more a fan of Akane's spinoff OVA, Akane Maniax as it was an enjoyable watch and Jouji was a cool male protagonist and I loved his personality, both he and Akane would've made a great couple. I think this series is in need of a remake with a faithful adaptation to Haruka's route, because I feel it is the best route of the series and incorporate more elements of Akane's route. People may dislike it for how things turned out in the end (since everybody loves a happy ending), but if you look at things in reality's point of view, it's how likely things will really be. The anime was able to show that 'other side' of love (more like the ugly truth of love) as it goes along with the passing of time. I think that each of the characters portrayed their roles very well. Interesting... this seemingly uninteresting anime has turned into something that has captured my mind. Smart as it is sweet, it seems to rely on the plot and the many wonderful characters rather than more conventional series out there. I would have liked it to be a wee bit more with a few secondary characters, but that is just me. 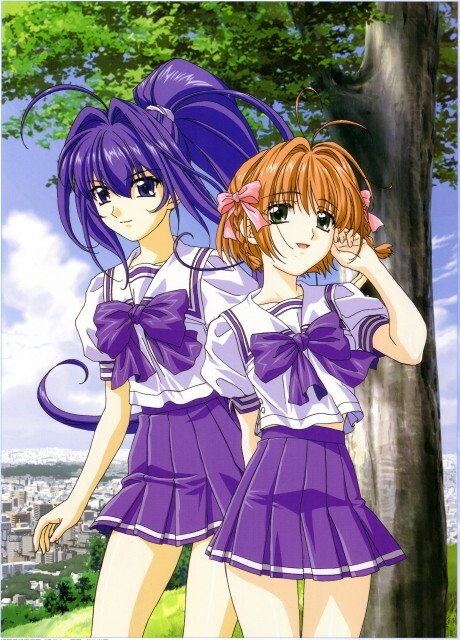 Kimi ga Nozomu Eien is more than worth it if you crave a anime that has heart and good writing. It is so good, I found a copy on line. I'm rating this seven point twenty-five since I'm not a huge fan of teary eyed animes, but this took it to a whole new level. I did not like the private moment of the characters, but what I really enjoyed about the anime is their emotions. I love how they showed their emotions throughout the anime. Even the supporting characters took it to the next level.